SkyForest™ data can be used to develop SkyStands for forest operations planning. SkyForest™ data is classified according to species mix, volume, canopy height and terrain into dozens of classes. Total softwood and hardwood volume can be calculated for each polygon or each class of polygons. The SkyStands classifications are based on customer mill requirements—providing a customized map product designed for your mill. The polygons will tell you where you can operate and how much timber you can expect. This will help you reduce your logging costs and make informed operational decisions. You will be able to develop harvesting plans that line up with mill demand. The SkyForest™ data terrain data can help you reduce time and cost to align access roads. The image below shows SkyStands superimposed on a harvest block. Red and blue areas indicate inoperable areas due to steep terrain (more than 20 degrees or between 17 and 20 degrees). 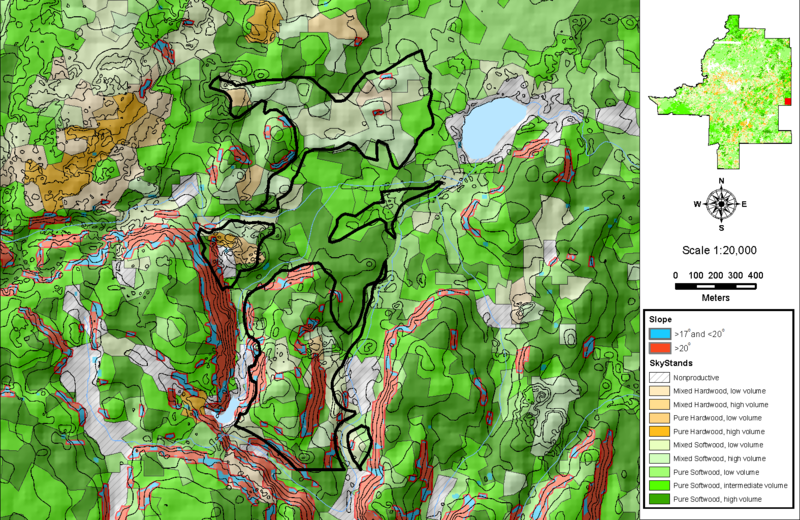 Contour lines are derived from the SkyForest™ digital terrain model.